At a hearing last week dedicated to energy technology innovation, members of the House Science Committee staked out differing positions on federal strategies for supporting R&D and technology commercialization. Last week, the House Science Committee continued its ongoing exploration of R&D policy with a hearing focusing on innovation in energy technology. Federal R&D investment strategy has become a critical issue since the Trump administration justified proposals for extensive budget cuts across R&D programs on the basis that many government-funded activities, such as later-stage research and technology demonstration, should be supported by the private sector instead. The Science Committee is an important source of support for the administration’s point of view. E&E News has reported that the committee pushed House appropriators to adopt the administration’s proposal to eliminate the Department of Energy’s Advanced Research Projects Agency–Energy. Ultimately, the appropriators proposed to eliminate DOE’s Energy Innovation Hubs and to halve the budget of the DOE Office of Energy Efficiency and Renewable Energy (EERE) as well. Those cuts were a central concern at last week’s hearing. It is time to let the scientists, researchers, engineers, and inventors ensure that the United States remains the world technology leader and is better able to address environmental concerns. In her opening remarks, Rep. Eddie Bernice Johnson (D-TX), the committee’s ranking Democrat, condemned the proposed cuts within DOE’s budget. She said administration officials had confirmed that they had not consulted with companies in the private sector to see what activities they would and would not support on their own in the absence of federal investment. She also lamented that the Science Committee had not held a hearing on the DOE budget at which members could probe the reasoning behind the administration’s request. 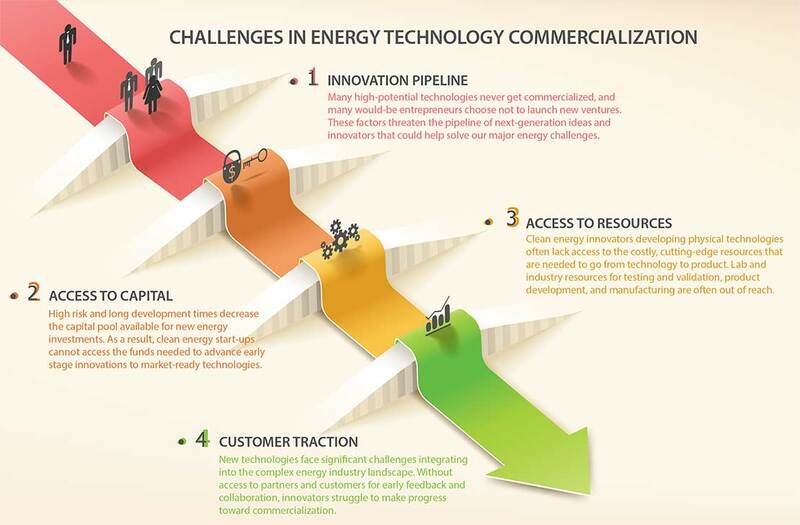 A DOE Office of Energy Efficiency and Renewable Energy graphic illustrating barriers to commercialization. Click to Enlarge. In my lexicon, there’s only one word: research. And research must be scientific research, physics research, technology research, engineering research. … If we do not combine so-called basic and applied research, it’s a missed opportunity. In general, the hearing’s witness panel offered nuanced views of the ways in which government can aid in R&D and technology commercialization. Gaurav Sant, a civil engineering professor at the University of California, Los Angeles, who researches concrete manufacturing using captured carbon dioxide, said it is important for government to support both basic and applied research until industries are assured of technologies’ “commercial value and potential.” He suggested this is particularly true for “conventional industries,” such as electricity generation and construction, which “feature reduced appetite for technical and commercial risk” due to factors such as profit pressures and regulatory compliance burdens. Narayanamurti said that different federal R&D investment strategies are appropriate for different industries, depending on the risk that companies will tolerate. He said that while information technology, for instance, is currently supporting extensive R&D work, that is “definitely not true” of the energy sector. Kiran Kumaraswamy, market development director for AES Energy Storage, said that “the existing power market is not designed to reward innovators,” noting that the rules governing the market were built around traditional power generation and do not account for “advanced technologies” such as energy storage. He advocated regulatory reforms and for the government to continue to support early-stage R&D in battery chemistries and to provide technical assistance to states and utilities undertaking their first technology deployment projects. Jacob DeWitte testified about his experiences as president and CEO of Oklo, a Silicon Valley-based company developing very small-scale advanced nuclear reactors. He said that Oklo’s technology is built on work pioneered by DOE’s predecessor, the Atomic Energy Commission, and that the company has benefitted from collaboration with national labs through DOE Office of Nuclear Energy’s Gateway for Accelerator Innovation in Nuclear (GAIN) initiative. In general, the witnesses agreed that federal programs best aid commercialization the more directly engaged they are with the projects they support. Narayanamurti pointed with approval to the ARPA–E model of giving project managers the discretion to assemble portfolios based on their assessments of projects’ risks and rewards rather than relying solely on a more distant and cautious peer-review process. DeWitte suggested that ARPA–E remains “a little too academic in certain areas,” but said the agency should continue to learn. If members of Congress are going to claim to support an ‘all of the above’ energy philosophy, then we need to support and fund an ‘all of the above’ research strategy to complement it.